GAUTIER, Miss. (AP) ­ Charles E. Hickson Sr. spent nearly 40 years living with something most other people couldn't even imagine. On Oct. 11, 1973, Hickson and Calvin Parker were fishing on the Pascagoula River. What seemed to be the beginning of a peaceful night turned to chaos when the pair suddenly found themselves in a close encounter with an alien craft and its occupants. Hickson Being Interviewed 1973, Parker on the right. 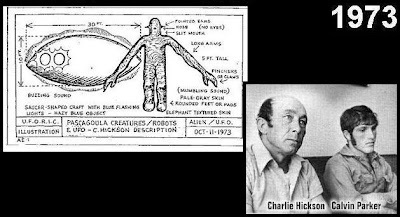 Hickson, then 42, and Parker, then 19, did not want their abduction publicized, but a reported leak to the newspaper made publicity inevitable. Hickson died Friday in Ocean Springs, officials with O'Bryant-O'Keefe Funeral Home in Gautier said Tuesday. Hickson was 80. After reporting the abduction, Hickson and Parker both passed lie detector tests and were even questioned under hypnosis. Investigators are on record saying the pair's story never wavered. Starseed Radio Academy Presents "Robert Morningstar: UFOs, Mars, and The Great Pyramid"
UFO Digest Spotlight on... Major George A. Filer & "Filer's Files"